The main output(s) can be selected between dimming or pulse control. 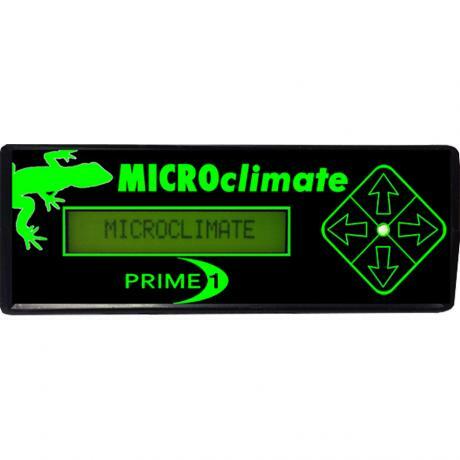 Once the control type has been selected, you can then either set a constant temperature, a Day/Night temperature difference, or up to 8 different temperatures throughout the day and night, simulating the natural environment of the animal. The Prime 1 has one main channel whilst the Prime 2 has two main channels. Both Prime 1 and Prime 2 have a second output that can either be used as an additional on/off thermostat, with the same timed temperature features as the main channel(s), or as a timed on/off output for accessories such as lighting or misting. If used as a timed on/off output, there are 2 different control options. The output can be set up to be switched on for a set amount of time at timed intervals (eg every hour for 10 secs), or the user can set 4 on/off times in any 24 hour period. All Prime thermostats can be used standalone or connected to a computer via USB. The unit can be fully programmed from the controls on the unit or when connected to a computer and can also be used as a datalogger. New features can be added to Prime thermostats by way of software updates incorporating new features. All Prime thermostats are designed and manufactured in the UK and carry a 5 year warranty.